Jars, Jars, and more Jars! 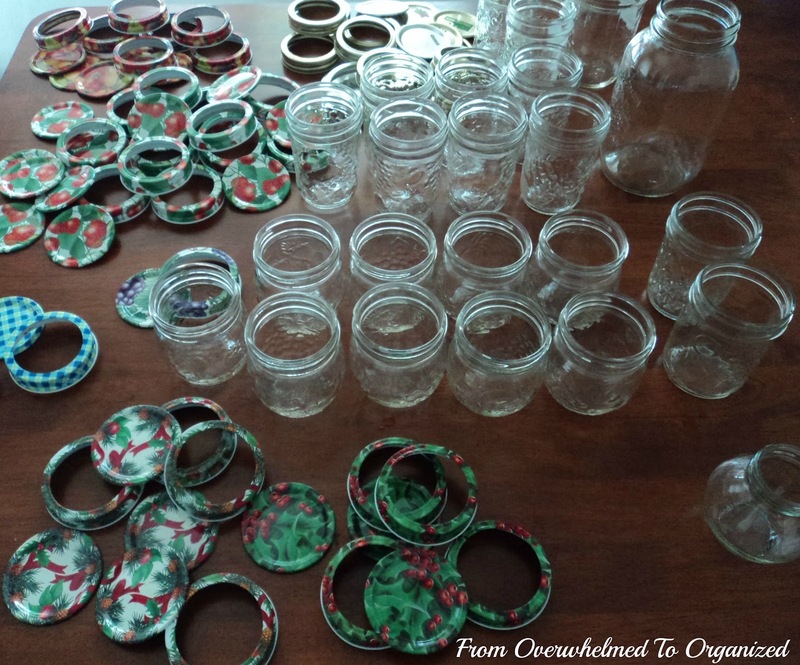 | From Overwhelmed to Organized: Jars, Jars, and more Jars! I am starting a series called "I Love Freecycle!". I'll post from time to time about things I've given or items I've been gifted on Freecycle. It will be dedicated to all things Freecycle. I've mentioned before how much I LOVE Freecycle. I've given away lots of items after decluttering various parts of my house (especially when we cleaned out the garage!). I've also picked up some amazing things along the way (like our entertainment unit and our TV stand). If you're not familiar with how Freecycle works, it's kind of like Kijiji or Craigslist except that everything is free. People post things they are giving away and other people respond to receive those items. You can also list things you would like to receive and people reply who would like to give away those items. 1. Freecycle is a great way to help you clear clutter from your house. Knowing someone else will be able to use the items you are giving away makes it easier to part with them. It's a little more personal than donating your things to charities (not that there's anything wrong with donating!). 2. Freecycle also helps you when you are organizing your home. Many people can't afford to spend a lot of money on furniture or storage containers and then they end up not organizing at all. 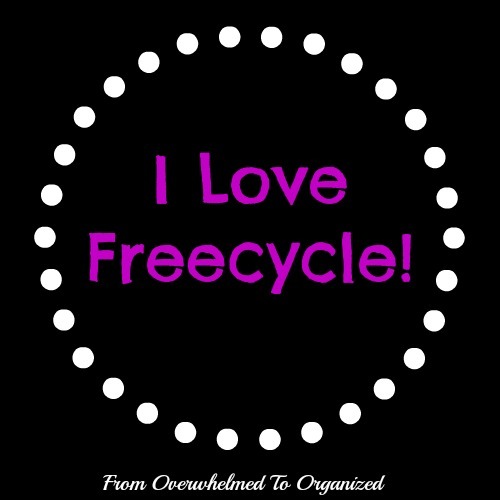 Freecycle lets you find what you need for free so there is one less excuse to keep you from getting organized! 3. Freecycle keeps tons of stuff out of landfills that would otherwise be destined to go there. Before finding out about Freecycle I would have just thrown out some of the things that I've given away on Freecycle and I know lots of other Freecyclers were the same. OK, enough about why I love Freecycle in general. Let's get to what I wanted to share for this first post in the series! 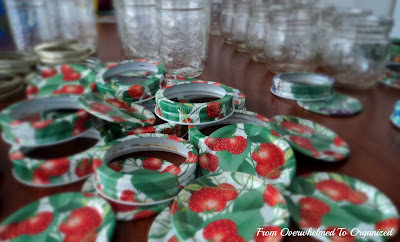 There are some regular plain old jar lids too but I love the pretty patterns on these! There are even a bunch of extra lids that were still in packages (I guess the person who Freecycled them to me must have bought extras but then never used them - I can relate to that!). So you may be wondering why I'm excited about all these jars. It's not really jam-making season (and if you've been following my blog or know me at all you may have noticed I've never mentioned making jam!). I did make jam a few times several years ago, but no, I'm not planning to use these for jam. I will likely use some of these jars for the above items as I continue to organize the rest of my house. But, the main thing I'm planning to use them for in the near future is my kitchen. I'm planning to organize my kitchen cupboards and pantry and will use these jars as I do. I've seen so many pretty pantries and kitchen cupboards with beautiful matching glass or plastic canisters and it makes it so much easier to see what you have. But buying lots of canisters is not in my budget right now. I really wanted to do something though instead of having lots of different bags and boxes. So, I'm going to use these jars and several mason jars that I had left over after we made our Gifts In A Jar gifts for the kids' teachers in June. In the meantime, here's one more pretty picture! What kinds of things do you use jars for? Great idea to do a series of posts about Freecycle, and those jars will be very handy! Awesome! Oh my gosh! I love jars too. I love making the all together cookie recipes as gifts for the mailman, teachers, co workers & bosses. I also use them to make layered salads I take to work. I love it I just add dressing & shake. I'd love for you to link up with me at Share Something Saturday! If your interested head over! I just saw the layered salad idea on TV this week...sounds like a great idea! I'd love to link up to your party :) Thanks for the invite and for commenting! Thanks Kristina! Freecycle is available in various places. It's through Yahoo Groups here but I'm not sure if it's always through Yahoo or not. It's a moderated group so some areas may not have it if there aren't willing moderators available. Hope you find it in your area! Let me just say HOLY SCORE!! :) Great job there! I can't wait to see your freecycle posts! Thanks Helen! I've only been using Freecycle for about a year or two so I'm not sure what it used to be like but it's definitely great now. I think you can join without a Yahoo account too because I get emails from people that are non-Yahoo addresses. Oh my, It is Jam making season for me!! You really rocked that one! I have to check out Freecycle! Cute blog, I am visiting from the G+ Party hop! Thanks Susie! I guess I'm not even up on when jam-making season is...I was thinking of strawberry jam which I know is over but I guess there are lots of different seasons depending on what kind you make! 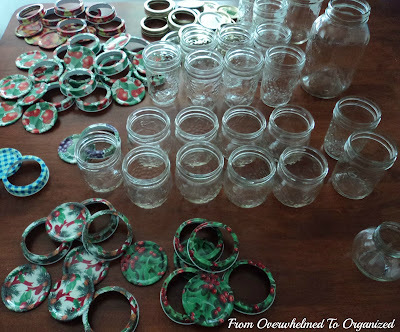 Freecycle is a great source for jars (if you can get them...lots of people want them too!). Thanks for visiting! Thanks Athena! I like that term...jar hoarder :) It's an easy trap to fall into. Glad to meet you and I'm following you back on FB. Have a great week too! I never heard of Freecycle before. I'm going to check it out since I'm starting my declutter challenge. Thanks for sharing at my Our Favorite Things Link Party. You're welcome Karri! Yes, Freecycle would be great for you during your declutter challenge! 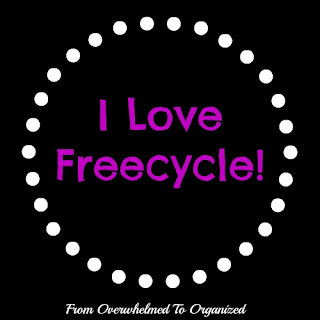 Your local community will love you :) If it works well, let me know and I will do a "Freecycle Feature" as part of the series! I do not think this is a concept that has reached Italy yet, certainly not our region. I just love these patterned jar lids, never seen any like this before. Hi LindyLouMac in Italy. I just did a quick search on freecycle.org and there are 23 listings for Italy so you can check if one of them is in your area. I've never visited free cycle, but maybe I should. I wish I had some of those patterned lids. What I use my jars for is canning/preserving. I do a lot, once I use the food inside the jars I recycle them for drinking glasses, flowers holders, utensil, pudding and so on. Thanks for sharing your creative inspiration with Sunday’s Best – you helped make the party a success! Thanks Cathy! You definitely should check it out...you never know what may be waiting for you :) And wow, those are some great ideas for jars! Thanks for sharing them all. I never thought of utensil holders or vases. Hi, I;m stopping in from the Flock Together hop. I'm a new follower. I love freecycle, you can't go wrong there. Great score, Hilda! I ended up with a lot of older Dominion and Corona jars last summer when we cleaned out the cold cellar of the cottage we inherited. I haven't done a lot with them aside from decorating on the mantel and for flower arrangements but I love knowing that I have them available when I come up with a great idea! 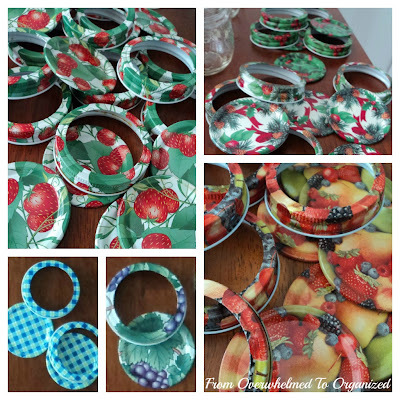 There was a funky canning lid pumpkin on the blog Simply Klassic yesterday that I replicated with my zinc lids. So easy and great for fall! You're right Mel! That will make it much easier :) Thanks for visiting and commenting! I'm so jealous! I would love to have all those jars. I have recently discovered how versatile they are and I love finding new ways to use them around my house! They are really versatile! Keep your eyes open on sites like Freecycle or at thrift stores...you can usually find great deals there :) Thanks for your comment! What a great idea- i've been wanting some of the minis for oatmeal snacks! Looking forward to seeing what else you come up with! Saying Hi from Mom on A Time Out Hop...I host Photo Friday Link Party, I'd love to have you link up this or any other original photo from your blog. Happy Hopping! Nice to meet you Ladies Holiday! Heading over to link up to your party now. Thanks for the invitation and for commenting! I love Freecycle too! It's awesome. Can't wait to see what you do with those jars! Thanks for sharing at The Fun In Functional! What beautiful jars! The strawberries and the turquoise gingham are the cutest!